Long ago, in a kingdom that no longer exists, a bohemian traveller was mistaken for a fugitive revolutionary, and arrested. The traveller was Russian chemist and composer Alexander Borodin. He was on his way to Italy with his friend Dmitri Mendeleev. Both men were researchers in the chemistry department of the University of Heidelberg, where they learned the ropes from Robert Bunsen (inventor of the bunsen burner) and Emil Erlenmeyer (inventor of the erlenmeyer flask). In a few years, Mendeleev would develop his own classic staple of chemistry labs – the periodic table – but now he was taking a break from science, and making his way to Italy with his friend. Picture these two men, dressed in their artists blouses, walking across large parts of Switzerland. Looking nothing like the academics they were in Heidelberg, they reached the Kingdom of Lombardy-Venetia. This kingdom no longer exists. The area is now Northern Italy, but was then part of the Austrian Empire, and Austrian police were on the lookout for a political fugitive. Seeing a bohemian figure who matched the description of the revolutionary they were told would cross the border that day, the police arrested Borodin. He was not at all the man they were looking for. Borodin had led a quiet and privileged life, filled with books, music, and education. After graduating from medical school in St Petersburg, he moved to Heidelberg to study chemistry. He spent all of his free time making music, and had already composed several pieces for piano, voice, or string ensembles. Much later, years after his untimely death at a costume party, Borodin would posthumously win a Tony Award for composing the original score used in the musical Kismet. He was a chemist, a musician, a Russian prince’s illegitimate son, a women’s rights activist, and an educator – but not a member of an Italian revolutionary movement. By the time the police realised their mistake, the real fugitive had taken advantage of the distraction, and crossed the border. When Borodin and Mendeleev finally boarded their train, they were greeted with cheers and applause by the Italian passengers, for unwittingly helping a member of the revolution escape. We don’t know the identity of the mysterious fugitive, but at the end of the Austro-Prussian War in 1866, the Kingdom of Lombardy-Venetia was no more. The region became part of Italy, which it still is. And somewhere along the way, two Russian chemists on a low budget holiday may have played a very minor role in shaping the political situation in 19th century Northern Italy. Source: the book “Borodin”, by Serge Dianin, translated by Robert Lord (1963). Mendeleev’s words about their outfits are quoted in the book, but originally from another book by M.N. Mladentsev and V.E. Tischenko, called “Dmitry Ivanovich Mendeleev. His Life and Work, Vol I.” (1938). 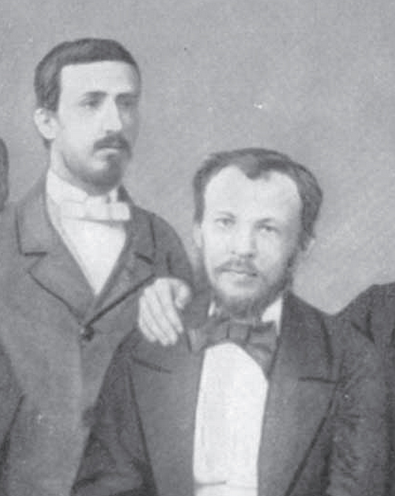 The photo of Borodin and Mendeleev is a crop from a larger photo including two other chemists – Gitinsky and Olevinsky. The original photo was taken in 1860 – the year this story takes place. 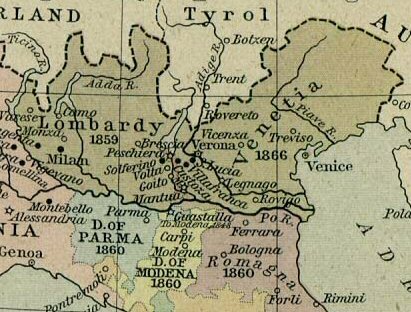 Lombardy-Venetia map in the public domain, via Wikimedia. This entry was posted in Follies of the Human Condition, Have Science Will Travel and tagged Alexander Borodin, Dmitri Mendeleev, Emil Erlenmeyer, Robert Bunsen, University of Heidelberg. Bookmark the permalink.